Since I love these Buddha bowls and the small, awesome variations, it only adds to my delight that the mister seems to like them, too. Now, he doesn't lick the bowl clean like I do, but he'll definitely eat all of the meat and the majority of the rice, plus some veggies, which makes me happy. SO! There's a few things that I did differently with these bowls that made them SUPER AWESOME, at least one of which may become permanent in our bowl delights. If you've read my previous posts, you'll know that the hubs isn't as keen on accepting a full quinoa swap as I am, and honestly I don't even know if he likes it as much as I do! He prefers to stick with his usual rice. 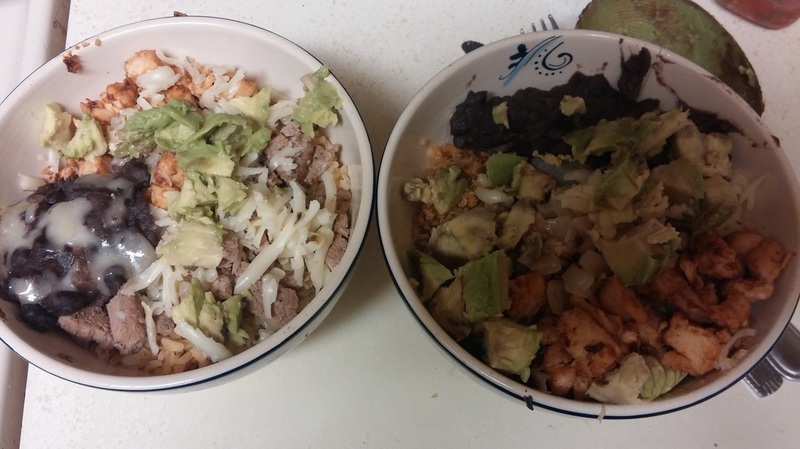 So, as usual, I prepped his rice for the bowl, only this time I got a great idea: since I'm making BURRITO bowls, why not make spanish rice?! Duh! Two spoons of salsa with some garlic and onion powder, a dash of chicken bouillon powder, and OMG. 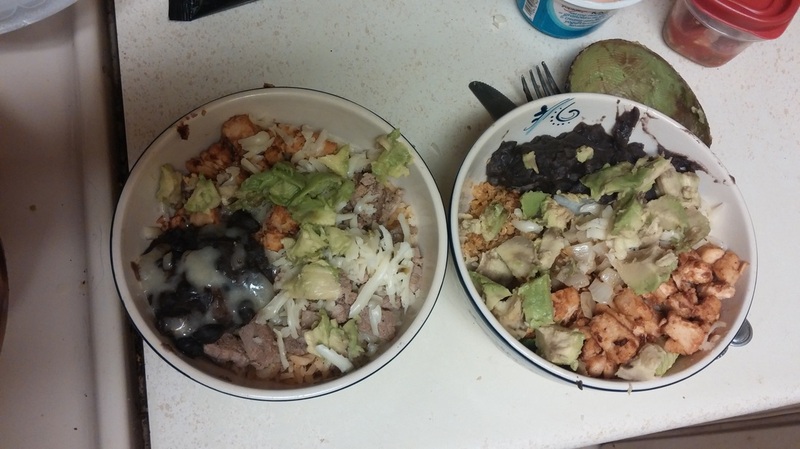 I tested out a new salsa for the rice, and it came out AMAZING. I almost made some more rice for my bowl, too. Instead, I grabbed some of my pre-made quinoa (made with chicken broth, of course) out of the freezer, threw it in a skillet with some of the salsa, and let it sizzle a bit until the moisture was absorbed. SUPER YUM! The fire-roasted chipotle salsa that I used lended such a great flavor, but isn't really spicy on it's own, so I usually add in some of the blended chipotles that I keep in the fridge. The rice and quinoa were spectacular, seriously. 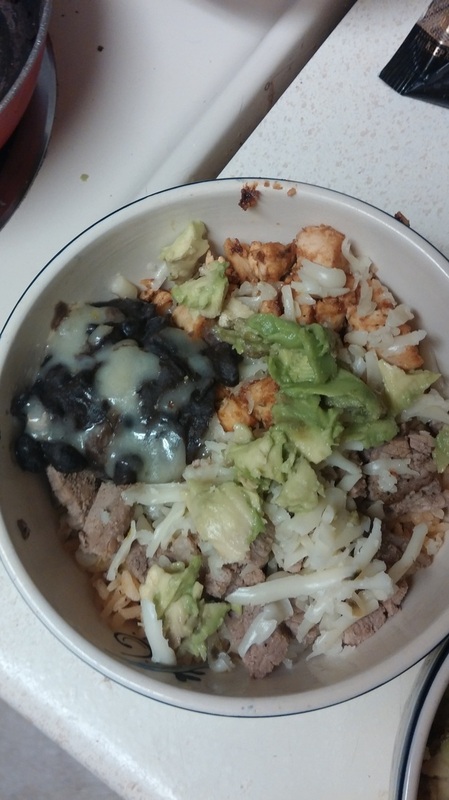 For the mister, I tried to imitate Chipotle bowls and used a mojo-marinated steak, chipotle-garlic-greek yogurt chicken, and a small bit of black beans, layered on a bit of lettuce and the rice and topped with pepper jack cheese and some avocado. 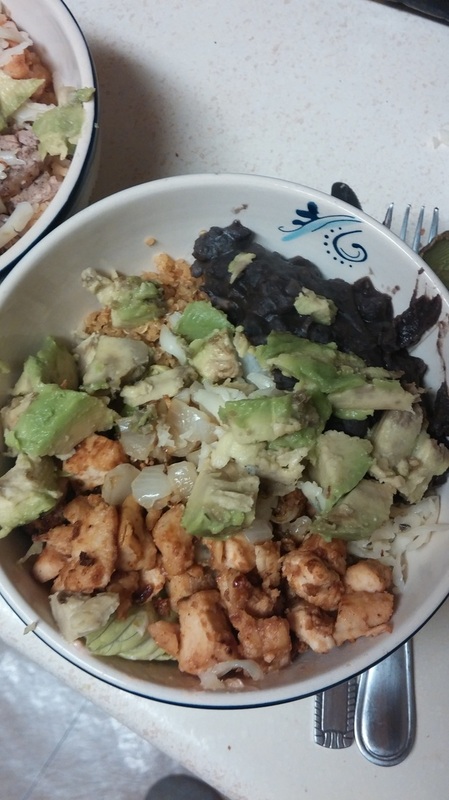 For my bowl, I add a ton of lettuce and quinoa to the side, then slab in a bunch of my awesome black beans, the spectacular chipotle-garlic-greek yogurt chicken, and a ridiculous amount of avocado. Plus a bit of pepper jack cheese. Seriously, so much flavor, so much delicious. And no oil used in cooking. Super yumbo!